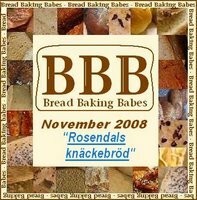 This month the Babes and I were treated to the national bread of Sweden, Knakebrod (crisp bread) and our host kitchen was Gorel. I have to admit to loving knakebrod. I always have a package of Wasa in the house to schmer some soft cheese on and top it with some cured meats. I really like the sourdough rye version of them so I was pretty excited to see this recipe because then I could make them at home. The added bonus of this month's recipe was we got to choose toppings for our bread! Now, you may remember when we did my Dark Onion Rye bread that we ran into some interesting problems with the rye flour from all our various regions and how it behaved in the recipe. So, I was prepared for some differences between how Gorel's authentic Swedish recipe described the dough and how my breads actually turned out and I was not proven wrong. While I had some breads that turned out very nice and crisp, I had others that turned out either chewy or tooth cracking hard. 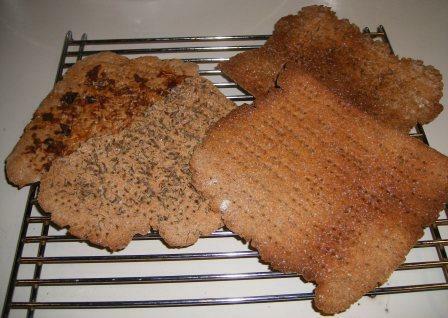 I really think it was a combination of the rye flour and the thickness I rolled the breads. All that being said, I really liked the rye taste of these and especially enjoyed the bacon and cheese topped version of the bread. Because of course, everything tastes better of bacon! !